The rattle from my rear mudguards on the way home (which I ignored, as it was only the rear) turned out not to be a loose stay bolt but a crack at the seat stay. Fortunately, the rear light wire would have prevented the rear portion swivelling round and scraping the ground. After having done literally nothing to my new bike (acquired in April) I noticed today the tires are a bit mushy - hence the incrementally increasing difficulty in pedalling over the last week or so. Pump at Saughton House doesn't seem to work properly (or I couldn't get it to work, so I blame the pump naturally) so I'll have to train it out to Dunbar this weekend for a general going over. Twitchy bum moment this morning on the tram path access road to Balgreen, heading for the cichane and my front brake errm broke. Gave the guy coming up the hill a start when I started making faces and trying to get my foot down for some extra friction. I've not had a good look yet but looks like one of the pistons isn't moving but just gently resting against the rotor. b) chain snaps again and I need to replace it on the road with the new chain. Got them fixed on Saturday morning and it's taken two further days of riding for me to realise I didn't replug the dynamo to my light. Would I be better at maintenance if I did it more often? Hmm. I usually forget to unplug the dynamo until I've tried to pull the wheel out of the forks, usually after trying to pull the wheel away from the forks without disengaging the brake noodle. I'll always remember to re-plug-in the dynamo (probably due to having to be aware of where the connector is in relation to the fork when putting the wheel back in) and front brake but sometimes get to the front gate before remembering to re-connect the rear brake noodle. Having broken my saddlebag last week, I've been using a rucksack. Which I left at the bottom of my stairs this morning and didn't realise until I was passing Meggetland on the canal. Cue turning back to pick it up. It's getting into this time of year when the very very enjoyable moment in my morning commute is the few minutes after I blow my nose when I stop to get off the canal towpath. I am more of a tissue person, you see and I haven't mastered the on-the-fly nose blow into the air. "the cyclists handkerchief" - No relation. @bill, you talkin' 'bout a snot rocket? you talkin' 'bout a snot rocket? The subject of the relative disgustingness of discreet hankies versus launching globbets of snot onto public surfaces should be approached carefully, as it might have been a contributory factor in forum departures. When said shoulder check is not performed. In my case, shoulder wipe also compulsory. @unhurt I tend to use gloves for wiping but I tried using shoulder today based on your recommendation(?). Couldn't easily reach my shoulder so i went for arm. I caught my face in scratchy velcro. Twice :P I think I will stick to my soft gloves. I explained to madame IWRATS the other day why cycling mits often have toweling backs on them. She smiled, knowingly. @IWRATS, you can also use the towelling sections to mop up the blood when your AWESOME POWER reaches 11 out of 10 and you snap off your right-hand crank at the spider, accelerate to the ground and break your fall with your kneecap. You may ask me how I know that. I took the long(er) way home from town today. Headed out to Portobello, ambled along the prom and met a very lovely, very hairy greyhound, then out to Musselburgh and Millerhill and Shawfair, whereupon I got lost four times at once. The National Cycle Network signage around there is terrible. Eventually I found the route signposted Loanhead and Roslin. That's why I've ended up going home along the Wisp twice after going to IKEA. The National Cycle Network signage around there is terrible. There's no NCN route there to be signed. That doesn't excuse the crap signage, of course, but it may change who's to blame. OK, not NCN but regular blue signs for cycle routes. You'd think the terminator for the Shawfair-Gilmerton-Loanhead-Roslin expressway would be readily identifiable, but it's just a wiggly nothing of a path leading off west from Shawfair Avenue. The ridiculous thing is, I have cycled this route before, albeit only in the other direction. You may ask me how I know that. It's about time we talked. I will ask you that. cyclist's handkerchief: step one, have a lot of air in lungs. The early freezingness and sensibleness of re-mounting winterspikes means I now won't have to remove and re-mount the non-winter tyre on the geared bike which has been annoying me since March (or whenever it was I removed the winterspikes) due to a noticeable non-roundness issue possibly caused by a disagreement between the anti-puncture tape and the tube. 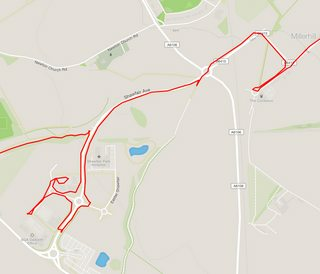 @Arellcat, was that an attempt at strava art. A drawing of a one cranked bike for instance. @acsimpson @arellcat I was thinking a very tall giraffe.